PAR means Photosynthetic active radiation is a measurement of light power between 400nm and 700nm. It is used to give an indication of the power of light present that is used by organisms which have photosynthetic cells such as plants and corals. The graph below shows the total light PAR and how it is used by various photosynthetic cells, zooxanthellae and the combined line of light used by all photosynthetic pigments. The part of the PAR spectrum that is used by photosynthetic cells is called PUR photosynthetic usable radiation. As a seneye measures both spectrum and PAR it can give a good idea of the % of PUR in a PAR value. As you can see not much green light is used and absorbed, therefore it is transmitted or reflected by the plant which is why most plants look green. It also shows a slight flaw in using purely PAR as a measurement; for instance a lamp with high levels of green light would measure very high PAR but have little usable light for food where as a more reddish lamp may have a lower PAR but produce a higher growth rate in plants due to it being a more useable spectra. A green lamp would also make plants look very healthy (while potentially starving them) as they would reflect the green light but look healthy. It is for this reason that specialist plant tubes which are normally red heavy often deliberately put a large spike of green light in there lamps so plants don't look dull. This is why the seneye 3 point RGB graph provided can help to point out where the light is peaking. Again to help we have added a tab to allow the user overlay the combined PAR graph and see how your lighting fits. We recommend that the seneye PAR function is used only as a measure against light readings taken from other seneye devices or a seneye PAR organism table. Why? most PAR devices are aimed for use in greenhouses where they are more interested in the red end of the PAR spectrum as this is where most terrestrial plant get there useful light from. 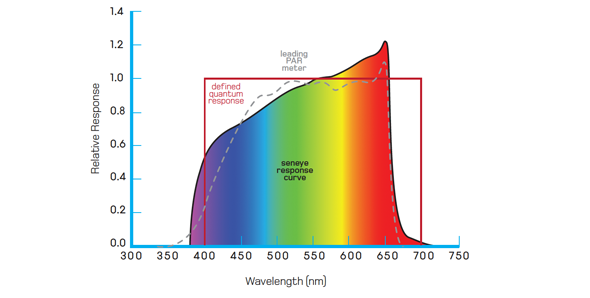 The seneye device is more sensitive than most at light below 450nm (bluer). This is arguably the most important spectra for coral and why most marine aquarists use additional actinic (03) spectrum bulbs. To understand what levels of PAR are needed for fresh water plants click here. To understand what levels of PAR are needed for coral and marine aquariums click here. To get the most out of taking PAR readings and storing them click here. Moreover the seneye device has no cosine corrector fitted; these are normally fitted to devices that are used to measure the sun so that they can be left in one position and the change in the suns angle depending on the time of year (its zenith angle) means that the reading is unaffected. In an aquarium with a fixed light source this is not needed and adding a cosine filter may introduce light from placing you don't want. In our view a narrow angle light sensor will allow us to look at light sources with more accuracy and directional control.